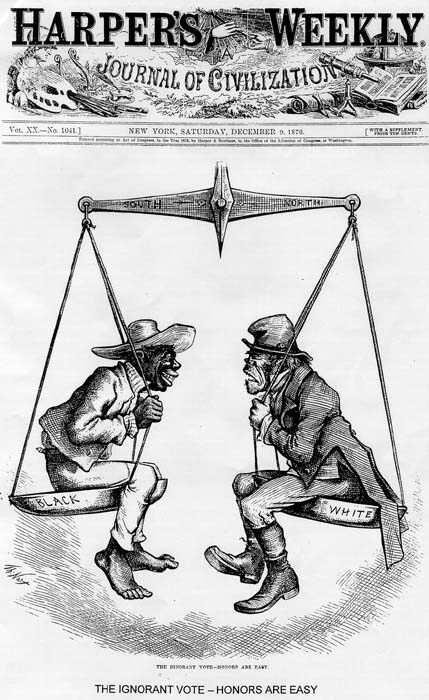 Race in America has had a complicated history, to say the least. And in the 20th and 21st centuries, historians have grappled with the subject in a variety of ways. Scholars have analyzed the economic and social underpinnings of race and racism. They've scrutinized the power of race as a social construction. They've looked into how race and racism have changed over decades and centuries. They've examined the long-term effects of race-based slavery . . And they've looked into how "whiteness" developed as a counter to blackness and as a marker distinguishing whites from non-whites. "The weaknesses of whiteness scholarship," observed Arnesen, "are particularly evident in its treatment of a subject that historians of the United States have chronicled for decades—the hostile encounter between Irish immigrants and African-Americans in the antebellum North." According to the Oxford English Dictionary, the term WASP was coined only in 1962, when the civil rights movement required an oppositional force against which it could protest. Rather than simply choose “white” (which would come later, and subsequently destroy much of our historical memory), the social landscape of the early 1960s demanded a more inclusive term. WASP is what social scientists came up with. served that need. . . .
Today, at the beginning of the 21st century, historians have shown that it has been politically, socially, and economically useful in our society to be seen as white, to possess an identity affiliated with whiteness.9 But for the first three or four decades of the 20th century, whiteness was not enough. One had to be considered Anglo-Saxon to achieve this status. And, like today’s “whiteness,” the phrase “Anglo-Saxon” lost any specific meaning once it be- came a social necessity. Everyone tried to claim it, and it lost all coherence. Webster’s Revised Unabridged Dictionary of 1913, for instance, defined Anglo- Saxon as “a person of English descent in its broad- est sense.” In 1925 Sinclair Lewis described his hero Martin Arrowsmith as “a Typical Pure-bred Anglo- Saxon American, which means that he was a union of German, French, Scotch, Irish, perhaps a little Spanish, conceivably a little of the strains lumped together as ‘Jewish,’ and a great deal of English, which is itself a combination of primitive Briton, Celt, Phoenician, Roman, German, Dane and Swede.” Clearly the definition of Anglo-Saxon had become diffuse, even if the term’s importance had not. Nevertheless, the abbreviated construction WASP picked up steam in 1963 as the civil rights movement progressed, appearing in that year in the New York Times and the New Statesman, although in each case the editors required a definition of the term to ensure that readers understood what it meant. Daniel Bell also paused to define WASP in his 1964 review of Nathan Glazer and Daniel Moynihan’s Beyond the Melting Pot. By the middle of the 1960s, though, WASP no longer needed an accompanying definition. After just a few years in circulation, everyone knew what it meant. Baltzell himself did a good deal to popularize the term in his 1964 book The Protestant Establishment: Aristocracy and Caste in America. And we’ve been stuck with WASP ever since. Interestingly, the term became calcified as a permanent part of the American lexicon even as its sociological and historical accuracy demanded further refinement. Instead of continuing to be sociologically useful, it became a type, often to be castigated and derided. One reason for this might be that the sociological utility of all the markers inherent in the word WASP declined precipitously in the middle 1960s. . . .
And yet despite the rise and fall of the recognized power holders, the term WASP has remained calcified in its mid-century conception. Today, it typifies a stuffy type, someone in the cultural and social elite who disdains things popular and dresses preppy. It’s a much-maligned class identity more than it is a sociological descriptor. Indeed, the distinctions marked out by being a WASP are not necessarily bound by whiteness, Anglo-Saxonism, or Protestantism anymore. They signify an attitude and a manner of living. They have become commodified as “preppy” or what used to be called “Ivy League.” Today, it signifies an elitist snoot, a highbrow more than an actual white Anglo-Saxon Protestant. For example, it’s not hard to imagine someone describing the manner of, say, W.E.B. Du Bois—who wasn’t white, Anglo-Saxon, or technically Protestant—as being WASPish. Read more of Schultz's interesting critique here. As someone who has played around with the various theories of whiteness in my own work, I also found Arnesen's essay very helpful, even if it struck me then as a bit too aggressive (mainly because it hit home a little too close for comfort). I guess one way to look at this is to say that the salient differentiation in American society has been less about defining whites against others, than it has been about defining blacks against others. It is "blackness" not "whiteness" that has mattered. That's probably why whiteness and waspness become so expansive and imprecise. Another question: isn't WASP redundant? I like your point about "blackness." That seems to fit more of the discussions in the 19th and early 20th centuries. How often did elites, ethnographers, or journalists write about shades of "white"? Those acronyms definitely don't roll off the tongue, but ASP does and that takes care of the redundancy. We have, I think, underplayed the cultural context of American racism in the nineteenth century. I'm currently at work on a project with a historian of China, and every time I see class or race struggle between native-born Americans and Chinese immigrants, he sees cultural conflict instead. It's as if I've been trained to see one thing, and he, another. I'm not going to dump my emphasis on class and race, but he's definitely got me much more conscious of looking at cultural conflict, too. @Randall: you can't have WASJ's - there are so few Anglo-Saxon Jews that it would be an absurdity to make a claim for them existing. You can have WJ's, though. Alex: Ever hear of intermarriage?